Are you still day trading or do you own Masternodes already? You might know the fun times of trading a coin that skyrockets and that depressing jump-out-of-the-window feeling if your holdings suddenly dump. A trader must have the ability to handle that kind of stress otherwise their sanity will suffer over time. But how “WOW!” would it feel to hold a good amount of rock-solid coins and to get paid for simply holding them? Very simply put, this is what you can achieve by running masternodes. This is the “Next Gen Hodl”. If we put the day traders rock aside, that we sometimes tend to live under, we can recognize the thriving rise and hype of masternodes. It is all the rage right now and an excellent opportunity to earn a passive income, just by holding promising coins and running a masternode on a machine. No more day trading stress, a rising income, paid in upfront determined cycles – Let’s take a breath and dive into “Zen and the Art of Masternode Maintenance”. Many people seem to confuse masternodes with mining, and whilst it is very similar in some basic elements, it is much more accessible to the majority. In this post, we want to clarify what a masternode is, why it makes sense to participate on ICOs that feature masternodes, why masternode-featuring coins are often a good investment and how to generate a long-term passive income by the use of this technology. By running a masternode, you run a full node on your server or machine, storing a copy of a particular cryptocurrency blockchain. Masternodes don’t mint new coins but perform a list of tasks, which are needed for several features a coin offers. In comparison to a common bitcoin node, it does not just keep the full blockchain and/or relaying transactions and blocks, but runs more specified tasks and enables the coin to offer particular functions. The most popular masternode coins might be DASH or PIVX and you will find the option to run a masternode on several other privacy-focused coins, as it makes so much more sense in this arena. Masternodes are the backbone of those privacy coins, and are similar to bitcoin nodes, they make it possible to run the network trustless and decentralized. Additionally, they add the masternode-specific features to the network, like a privacy feature in this instance. By an implemented anonymization protocol (e.g. Darksend), for example, the network makes use of the existent masternodes to validate the transaction and to process it in an anonymized way. For providing this machine calculation power the masternode owner gets a financial compensation. Typical functions provided by masternodes to the network of a cryptocurrency are sending instant transactions, anonymize them, participating in voting and governance – there are countless creative ways of what a masternode can achieve. The main advantage in comparison to mining is, that you don’t need an expensive hardware setup to run a masternode, but instead, you will need to hold a given amount of that coin in your wallet to be able to act as a masternode. Furthermore, you will be rewarded with a constant passive income stream for running that node. The compensation can vary by different factors, like how much coins or tokens you hold, how busy the network is or how the fee structure is designed. In one lengthy sentence: you set up a wallet on a machine with a dedicated IP, fund it with a defined minimum amount of coins/tokens and contribute to the network by letting it perform several actions – for that you will be financially rewarded – and those rewards are really juicy sometimes. First of all, you need to hold a certain amount of coins of that particular masternode coin. There are many different kinds of models on how much stakes you need to hold to run a masternode, so it might be an excellent idea to watch out for ICOs that feature masternodes. This is your best bet to get the needed stakes to run a masternode for the cheapest price possible. If you missed an ICO for a project, you are interested in, you might want to wait for a dip to purchase at a good price. One can say the Masternodes concept is something like a “Next Gen Hodl”. For PIVX, for example, you would need to hold 10k of PIVX (current price: ). Quite a stack to hodl. Often there are tiered models like with one of our favorite upcoming projects “Halo Platform“. If you never used a command line interface (often referred as CLI), this is going to be hard for you – not impossible, though as we all can learn, if motivation is given. For several reasons, a virtual private server (ref. as VPS) is not inevitable in every case, but for the most of the Masternodes. The process is not always the same, but mostly you want to install a controller wallet on your local machine and the Masternode on the VPS. If you want to get a basic picture of how such a thing is done, check the PIVX Masternode setup tutorial here as an example. Not all Masternodes require you to have it up and running 24/7 and some have even easy Windows installation routines, though the majority will be a pain to set up if you are not familiar with that kind of stuff. As always, there are services to purchase to help you get started. How much can you earn with a Masternode? Masternodes can be rewarding, but also can be a bad deal to lock your funds, so you are better researching before hopping on a train. One of our favorite long-term holdings $Strat, for example, needs a huge initial investment to get in. Here you need 250k Strat (current price: ) to run a Tumblebit node and contribute to the breeze privacy protocol. So, if you buy in now to set up the masternode you would need a very high initial investment. If you bought $Strat at ICO price (a mere $0.007) it would have been an option to furtherly increase your ROI just by holding that coin without a big effort on your part. That being said, Stratis will have also different kind of masternodes which allow you to get in cheaper in the future. To get a picture of the rewards, you can check Stratispool to do the math. Block reward of 4.5 Halo / received service fees of 5.00%. Initial Investment: 500 Halo ( $5000 USD* ). Estimated Reward: 0.324 Halo per day and 9.72 Halo per month. Initial Investment: 1000 Halo ( $10,000 USD* ). Estimated Reward: 0.675 coins per day and 20.25 Halo per month. Block reward of 5.50 Halo / received service fees 12.50% service fees. Initial Investment: 2500 Halo ( $25,000 USD* ). Estimated Reward: 1.98 coins per day and 59.4 Halo per month. Block reward of 10Halo / received service fees 25% service fees. Initial Investment: 7500 Halo ( $75,000 USD* ). Estimated Reward: 7.2 coins per day and 216 Halo per month. Imagine that compounding effect – by setting up your masternode you generate more Halo, more Halo means higher tiers, higher tiers mean higher rewards. You get the picture. However, one has to keep in mind, that you should run a Masternode for a particular project only if you believe in its success. The more Halo will be used, the more blocks and fees will be generated in which you participate. If Halo flops in terms of community acceptance, you will have sitting thousands of Halos around decreasing in value. Doing your research is a must, before any investment decision. Another example is LUX. We told you about our investment in our HODL THAT! #2 issue when the price was 0.00038 sat. See where the price is right now: . Check out the masternode stats and do the math how rewarding LUX would have been if you bought those coins when we talked about it and used them for a masternode! The insane growth of value for LUX is also due to the rewarding masternodes, out of a total supply 400k, there are 210k locked in masternodes due to the great rewards (annual ROI of around ~50%), now bring that into the picture with basic economics of supply & demand. To sum up, we have the growth in value of the token or coin itself plus the very nice rewards it offers. Outlook: is very bright indeed. This effect can be watched on many tokens and coins that offer Masternodes as there is a strong incentive to hold, which ultimately decreases the available supply. This is why we call Masternodes the “Next Gen Hodl”. It is the Zen-way of growing your money. No more fear sweat with your day trades, just throw that masternode on and relax, see your investment grow over time, may BTC soar, may BTC dump – you just sit back and enjoy the show. Yes, that insane rewards on top of your “Hodl-Gains” can be very teasing. At the same time, most of the projects that proven themselves already are pretty expensive to get in. That being said, there are shitcoins which run masternodes, but only because it is a cheap opportunity to get into the Masternode game, it might not be a good idea to go cheap. We urge you to research the projects as much as you can, that you never invest money you can’t afford to lose. This is not a rock-solid way to double your money in one year – as with every well-paying opportunity, there is risk involved. Just imagine Bitconnect would have run masternodes – where would your investment be now? With running a Masternode, you are not a trader anymore, you are an actively participating investor. Think like one. What will this project offer to the world and why is it needed? Which guys are behind the project and what do they have cooking on the stove for the future? Generally spoken, with all sorts of regulation incoming, new tax laws popping up everywhere and the mass adoption, many investors see a rising demand for privacy coins. Those are often depending on Masternode technology but at the same time this market seems to be pretty saturated already. But keep your eyes and ears open for privacy-focused ICOs in connection with Masternodes – it might be a great opportunity to become a master of the node! My growing interest in this project comes from having had a few back and forth mails between their team. As it was confirmed to me that ZenCash is looking to establish somewhat of a self sustaining economic system. My suggestion to them was to implement a decentralized lending platform similar as MakerDAO and it was well received. Supernodes aren’t out yet, but with their whitepaper coming up in the next few days it is possible that we will see some more information on them. On Telegram, staff has been stating that the planned release of Supernodes will be around the end of May to mid June. Right now each Securenode generates around 1~ ZEN each month. Hosting can be done on a VPS, the coins needed for staking collateral can be held in cold storage, as the node and wallet only need to point at each other. It is possible to host a node as cheap as 3$, but this requires 2-3 nodes per host, and some sysadmin background. There is some managed hosting starting around 9.99$ up to 15$ per month per node. 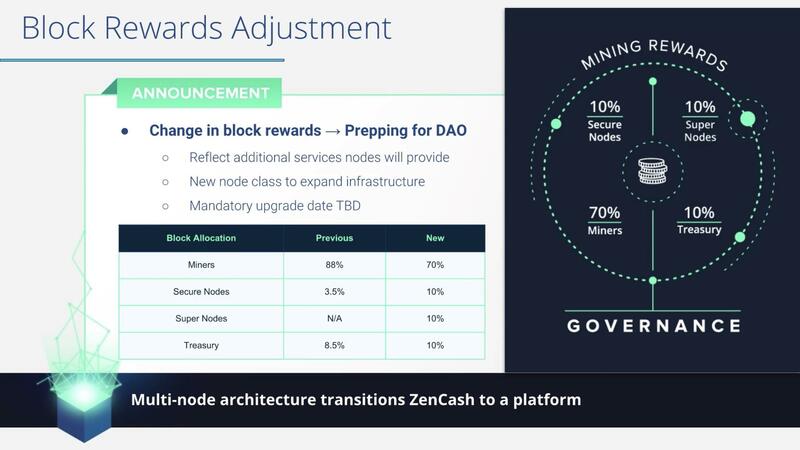 So far that’s it, I may have overlooked some items but that’s the most straight forwarded overview I can give on ZenCash. Thank you, Edwin for this valuable roundup!